Siachen is the world’s highest active battlefield, contested by India and Pakistan since 1984 when India launched Operation Meghdoot. Siachen tragedy: “With deepest regret we have to state that chances of finding any survivors are very remote,” said Defence Spokesperson. All ten soldiers who were hit by a massive avalanche at Siachen on Wednesday have been declared dead by the Army. “It is a tragic event and we salute the soldiers who braved all challenges to guard our frontiers and made the ultimate sacrifice in the line of duty,’’ said General Officer Commanding-in-Chief Lt General D S Hooda. The Ministry of Defence had earlier in the day said the chances of finding any survivors were very remote. “With deepest regret we have to state that chances of finding any survivors are very remote,” said the Defence Spokesperson. 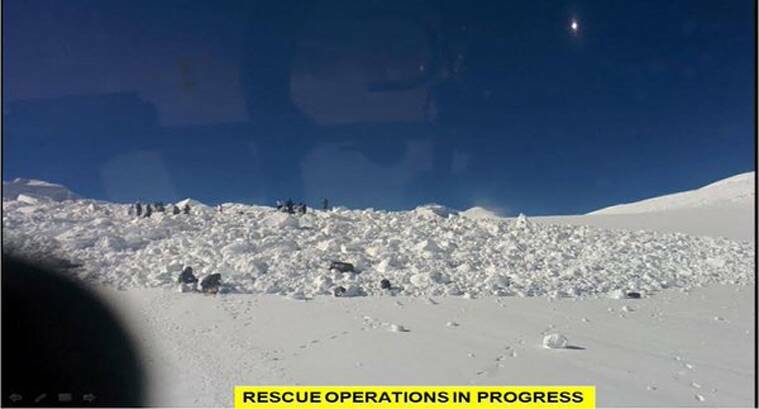 One junior commissioned officer (JCO) and nine jawans of the Army’s 19 Madras battalion had been trapped after an avalanche struck their post in Siachen early Wednesday morning. The post is at 19,600 feet on the Actual Ground Position Line (AGPL) — the border with Pakistan at Siachen glacier — in the vicinity of Bana post. State Governor N N Vohra also expressed shock over the deaths. A Raj Bhawan spokesperson said the Governor spoke to Northern Army Commander Lt General D S Hooda to convey his heartfelt sympathy to the bereaved families over the tragic loss. He lauded the brave officers and men of the Indian Army who serve in the most difficult areas, brave all odds and even give away their lives for safeguarding national security, the spokesperson added. Siachen is the world’s highest active battlefield, contested by India and Pakistan since 1984 when India launched Operation Meghdoot. In April 1984, the Indian Army moved in to pre-empt a move by the Pakistan Army to occupy the glacier. Indian Army currently occupies the full Siachen glacier, while Pakistani forces are deployed at the lower heights of Saltoro ridge.